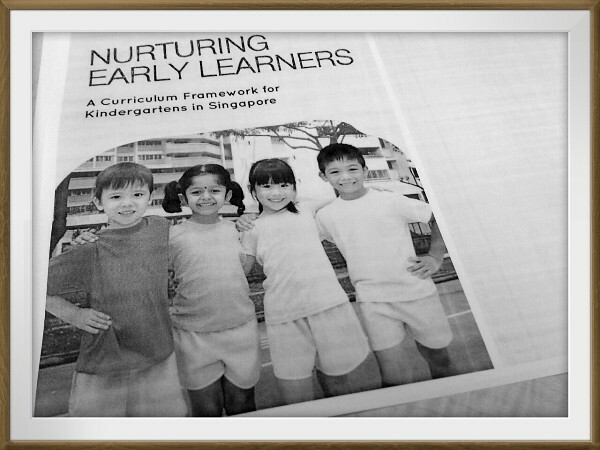 Finally, I saw what I wanted to see – the new kindergarten curriculum framework released by the MOE recently. If you’re a kindergarten parent, I’m sure at some point, you’ll wonder how much should you prepare your children for Primary One. There is no national curriculum for kindergarten, and all pre-school programs vary from operator to operator. When I first read about this kindergarten framework, I was so excited. I dislike reading from my computer’s screen, so I printed it out. When I picked it up from my printer, I was surprised that it contains 125 pages! Luckily, I’ve set my printer to print 2 pages per sheet and double-sided. So, it’s just 32 sheets for me to read. So, please be warned if you wish to print it. Good or bad, kindergarten lessons today are a far cry from the kindergarten activities a few decades ago. Today, our kindergarteners are spending less time on play and more time on academic pursuits such as reading, writing and maths. Many kindergartens are operating full-day, rather than the previous norm of half-day. And also, many kindergarteners get homework, sometimes even on daily basis. I can still remember my kindergarten school days. We had a lot of class activities like arts and crafts, singing, dancing and performances. We didn’t have homework, we didn’t learn phonics, and we didn’t do any maths either. Okay, maybe a little bit of maths but I’m sure it’s not more than ten. No spelling tests, that’s for sure. Personally, I dislike kindergartens that are too academic-focused or with excessive homework. It’s a nightmare for me if Edison comes home with a folder full of photocopied worksheets for homework every day. Or worst of all, a whole long list of words for spelling test or dictation. Imagine a working mother like me – by the time I reached home, had dinner, showered and packed-up for tomorrow, it’s already 8:30pm. There is only 1 hour left before the boy goes to bed. I certainly don’t want to spend this one hour pushing him to do his homework. I have my own worksheets and materials to teach him at night, to supplement what he is learning at school. We’ll usually spend half an hour doing these worksheets, and the other half to read a book or revise on the lessons from his enrichment classes. But don’t get me wrong. Homework is okay, but as with all things, moderation is the key. In my point of view, kindergarteners shouldn’t spend more than half an hour a day on homework, and the homework should reiterate the lessons that are taught in the classroom. So, I’m off to read the kindergarten framework tonight (for my homework :p) and see which areas that we’re lacking and how to improve them. Are you reading this kindergarten framework too? Do you think it is useful? See that they just put in the teaching and principles from PCF framework..
A copy and paste? :p My son is not in PCF kindergarten, so I’m not sure about it. The framework is very detailed. It covers the academic and non-academic aspects. It serves as a useful guidelines for kindergarten.